Going after bloggers has the effect of making other bloggers take note, even if they aren't close followers of the blog in question. I've noted a number of attacks on bloggers on this blog, but most of the Egyptian bloggers who've been hauled before courts have faced civil courts. Here's a blogger who's facing a military tribunal in Egypt. The very fact is that this — trying a civilian in a military tribunsl — is possible only due to the the Emergency which has been in effect since the Sadat assassination in 1981 (way back when Ronald Reagan was a fairly new President of the US, Leonid Brezhnev was still Soviet General Secretary, Margaret Thatcher was British PM, and, umm, Husni Mubarak was President of Egypt). More on the issue here. He seems to have gotten in trouble for "defaming the armed forces" by revealing an abuse of privilege. It reminds me of the old joke that someone is arrested for saying "the President is an idiot." Is the charge defamation? No, it's "revealing a state secret." I haven't said anything about Brother Leader Qadhafi's call for a jihad against Switzerland, issued to mark the Prophet's birthday, mostly because he's been waging a propaganda campaign against the Swiss since the arrest of his son Hannibal and his wife in 2008 for beating up two servants. Of course the Swiss vote against minarets gave him an additional talking point, one that goes beyond the personal vendetta element and actually is a genuine grievance in its own right, that can win support from other Muslim countries. The apparent use of the loaded word "jihad" is of course getting attention, and the United Nations has said they're against it (heck, their second major headquarters is Geneva), and we are generally used to what The Moor Next Door famously referred to as Qadhafi's "stream of consciousness foreign policy." The latter has argued that the West is acting as enablers for Qadhafi, being so interested in Libyan oil and gas as to look the other way when he goes completely gonzo. I think there's some validity to that point: if he were just another African despot in a country of a few million people, he wouldn't get the same press. It would be treated as a Mouse that Roared scenario. For my Muslim readers, best wishes for the Prophet's birthday, Mawlid al-Nabi. Today marks a week since Mohamed ElBaradei returned to Egypt. The government still seems uncertain what to make of it all. Yesterday's rare hailstorm in Cairo and violent rains also might seem like an omen of sorts to some. I don't want to overkill the topic, though it's captivated Egyptian bloggers and independent media. But it's been an activist week. During his first week, ElBaradei met with‘Amr Moussa, the Arab League Secretary-General who has also dropped hints of a willingness to run; then he met at his villa with various opposition figures and announced the formation of a national front to promote constitutional change, and has also met with his younger supporters from Facebook and other groups promoting his candidacy. Meanwhile various establishment types continue to disparage him. And Coptic Pope Shenouda, who has pretty much openly endorsed Gamal Mubarak, has expressed no opinion on ElBaradei amid reports that the ruling party has asked him to bar Coptic bishops from expressing support. And he's given a number of television interviews, some to pro-government media. Besides not wanting to over-cover this story, of course there's another major caveat: I'm not there. Sometimes through the wonders of newspaper and television websites and YouTube, it can feel as if we really are all wired into each other, but in fact, I'm not there and haven't been there in several years. So I'm going to collect some of the more intelligent and thoughtful analyses, concentrating for now on those in English, of those who are there. The other concept advanced by ElBaradei – and one that has taken many by surprise – is an impassioned embrace of the type of European-style social democracy he saw during his long residence in Vienna, where the IAEA is headquartered. This idea has a strong appeal in a country where the majority of the population lives near the poverty line and social justice is lacking. Traumatised by galloping inflation and dramatic loss of purchasing power over the past decade, with strikes taking place almost continuously across the country for the last three years, Egyptians have been unconvinced by the government’s action toward economic liberalisation without any political counterpart. Again, India has been a reference in ElBaradei’s thinking, not only because its political system is one where the poor do count, but also because it has been able to handle other social injustices, such as discrimination, quite well. If Manmohan Singh, India’s Sikh prime minister, can come from a community that accounts for only 2% of Indians, then why shouldn’t Egypt be able to have a Coptic president, he asked on one political talk show? In many respects, ElBaradei is advancing ideas that are much more progressive than the Egyptian mainstream, and he is already taking some flak for it. The article also notes that the Facebook group backing ElBaradei has passed 100,000 members and is growing by 13 members a minute. Five years ago today, when Hosni Mubarak made his big announcement about direct, multicandidate presidential elections, he couldn’t have dreamed that five years down the line, he’d face a most unexpected challenger. Someone who is everything that Mubarak and his son aren’t: internationally respected, intellectually nimble, and domestically popular. 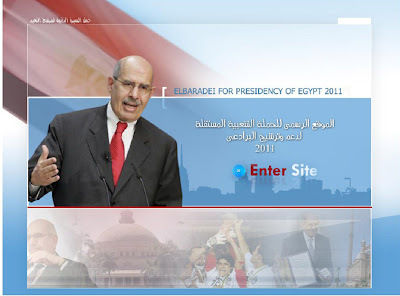 Who knows whether ElBaradei has a real chance at the presidency? What’s clear is that his return to Egypt has completely flummoxed Mubarak and his retinue. Up to now, they’ve dealt handily with all the domestic politicians and pressure groups who’ve opposed their rule, ridiculing some, imprisoning others, co-opting still others, and simply exhausting whoever’s left. Along comes ElBaradei, with an energetic mien and an organized plan. His international standing ensure that he can’t be repressed or ridiculed. He’s made it crystal clear that he won’t be co-opted. And the incredible surge of popular enthusiasm that’s enveloped him makes it unlikely that he’ll get tired and retreat. Elections have always been nuisances for Mubarak, now they’re turning into nightmares. Why? First because ElBaradei shows up the ridiculous rules governing the political game. The laughingstock Political Parties Committee, the crazy restrictions of Article 76 on presidential candidacy, the elimination of judicial supervision over elections, and the nefarious provisions littering the law governing political participation. The Egyptian opposition has been crying foul over these things for decades and decades, but the criticism sounds a lot more credible when it comes from someone with impeccable international standing. Second, ElBaradei’s entry certifies the beleaguered Egyptian opposition. I’m talking about the real opposition, not the fake opposition parties in Wust al-Balad and Dokki licensed by the regime. Some so-called analysts’ favorite pastime is to sit around announcing the demise of Kifaya, the Ikhwan, al-Ghad, the various reform groups among the professions, civil society associations, etc. ElBaradei’s joining of their ranks and endorsement of their decades long demands for constitutional reform, fair elections, and redistributive policies suddenly raises their profile and makes it that much harder for the regime to dismiss them as fanatics, lunatics, foreign agents, loudmouth nationalist-populists, or what have you. Like El Amrani, she's careful to say it isn't clear how ElBaradei could even stand as a candidate, but he's clearly something the regime doesn't quite understand. He can't be harassed with trumped up charges ( as were Saadeddin Ibrahim or Ayman Nour), scapegoated and made into a bogeyman like the Muslim Brotherhood, and he's a well-known face internationally, which offers him form of protection since the regime is always sensitive to criticism, especially by its major US aid provider. Over at Bikya Masr, Joseph Mayton hints that the synagogue attack in Cairo the other day may have been intended to divert attention from ElBaradei. High strangeness here. ‘Ali Tounsi, Algeria's Chief of the National Police (DGSN) was shot dead this morning during a meeting by a subordinate. BBC here; but you'll gain a lot more background from this post by kal at The Moor Next Door. Obviously there are tensions between President Bouteflika, Interior Minister Zerhouni, and the security services. Though this is being blamed on a manic outburst, there may be more than meets the eye. Read kal's piece as background as the news breaks. Now, if you do a little googling you'll find that half the newspapers played this as "Israel unveils drone that can reach Iran." Well, yeah. But it was "unveiled" in the sense that it's become operational. Its existence has been reported for some time; its Hebrew name is Eitan. It's big, though there are questions about it being the world's biggest UAV. As far back as Vietnam the US was using remotely piloted fighter aircraft, and apparently the Global Hawk has a bigger wingspan. One of the few commenters not to jump on the "can reach Iran" bandwagon is Jeremy White at Huffington Post in this piece, "Israel's New Drone Not for Use Against Iran." Generally he makes the important points — it's slow-moving, vulnerable to air defenses, and probably can't carry the heavy bunker-buster munitions you'd need to take out hardened Iranian nuclear facilities. His article is spoiled a bit by the phrase "Despite the fact that the Heron TP does look quite like an F-15 . . ." It looks less like an F-15 than this overweight 62-year-old white-haired blogger looks like George Clooney. No one with even marginal eyesight could mistake it for an F-15. Watch the video above. Still, the points made are good. This thing would have to fly over either Turkey (and Turkish-Israeli relations are bumpier than they've been for years) or Iraq or Saudi Arabia. And it's highly vulnerable to anti-aircraft fire. We use Predators against the Taliban because they don't have any air defense. It's slow and cumbersome. It probably can't carry anything like the ordnance required to take out hardened underground sites. Iran can relax: iuf Israel attacks, this won't be the vehicle. Though I'm sure the decision to publicize it at this time was intended to create the illusion it was intended for Iran. In fact, the Israelis were true pioneers in the UAV field. While the US Armed Forces spent much of the 1980s and early 1990s developing some basic ancestors of the Predator, both Israel Aircraft Industries and Tadiran had cobbled together two functional UAV's prior to the 1982 war in Lebanon. They were pretty much wooden remote-controlled hobby aircraft with cameras and downlinks, but they did the job. But I think Iran needn't worry about the Eitan/Heron TP. That doesn't mean Israel isn't going to strike, but this is a red herring. Or red Heron. When you start posting on camel beauty contests, first you naturally have to do the occasional follow-up, and then people start E-mailing you about camels. Ah, well. Feb 23, 2010 - 04:57 - WAM Ajman, Feb 23rd, 2010 (WAM)--His Highness Sheikh Humaid bin Rashid Al Nuaimi, UAE Supreme Council Member and Ruler of Ajman, will attend Wednesday the fourth Camel Beauty Contest and Camel Race Festival for UAE nationals, with Ajman Crown Prince HH Sheikh Ammar bin Humaid Al Nuaimi's Award for grab. The official launch will also be attended by the sponsor of festival Ajman Crown Prince Ammar bin Humaid Al Nuaimi. Sheikh Ammar called on judges to observe age of a camel and other characteristics when they grant marks in the camel beauty pageant. I just noted that the two posts immediately preceding both used the phrase "operational security." Not words I use every day, usually. It goes to show just how much the news seems to be like something out of a spy thriller lately. UPDATED: In tomorrow's Ha'aretz, Yossi Melman, who generally knows this beat pretty well, raises some questions about the details emerging: "Was Mossad on a Fantastic Adventure in Dubai?" The more elaborate this gets, the more unprofessional it seems. There are now 15 more suspects in the Mabhouh hit in Dubai. So there are now 26 suspects in all, and this chart from Gulf News (PDF) shows how they are linked to each other. Assassination hit squads: mainstay of the Dubai travel industry since 2010. Mossad chose its operatives' passports carefully. It turns out that some 33 nationalities do not require visas and are not subject to the routine iris scans that UAE introduced at all points of entry in 2002. Abu Dhabi's National has a good article at [link]. 2010? Come on, Dubai has been the assassination capital of the region since at least 2008 -- Suzanne Tamim, the Chechen warlord gunned down in '09. Who am I missing? Just embarrassing for Mabhouh to get it in Garhoud when the Dubai Marina has been THE place to get killed for quite some time. Will: I suppose three makes it the "assassination capital of the region," geographically limited, but London balcony falls have accounted for four Egyptians so far (Ashraf Marwan, Nasser's son in law and alleged Israeli informer; actress Suad Husni with vague rumors of shady ties; Al-Leithy Nassif, Egyptian Ambassador to Britain; and Ali Shafiq, aide to the late Abd al-Hakim Amr. Must be the ice on the balconies. Admittedly, Dubai's been a lot livelier lately, like Istanbul in an Eric Ambler novel or something. And Larnaca is still in the running, I think. Since the comments on this post are more interesting than the post, I thought I'd move them up here. After yesterday's allegations, this doesn't add to Hamas' internal security confidence: Ha'aretz is reporting that the son of a founding Hamas figure whose (the son's) conversion to Christianity was already a major scandal, worked for Shin Bet for years. If true, and disinformation is always a concern in these issues (especially given the timing), it's just another blow to Hamas' sense of operational security, though this guy converted to Christianity and has been living in California. The fact that his handler "Captain Loai" is quoted in the article, makes it clear that he's coming in from the cold primarily at the instigation of his former employers. So that should be kept in mind in judging his story. Iran claims to have arrested the leader of Jundallah, the Army of God, a Sunni opposition movement that has long carried out attacks in Baluchistan and other parts of southeastern Iran and which I've mentioned previously through the link above. Some of the stories: The National (Abu Dhabi); BBC English (Middle East); Al Jazeera English; and for an Iranian viewpoint, Press TV. I know little about Jundallah, but I know that Iran has claimed for years that the US has been supporting it and now is saying the captured leader trained at a US base in Afghanistan. I have no idea if that is true and do not assume, as some might, that anything bad someone asserts about the US is true, but I also recognize that there has been, at least prior to Al-Qa‘ida and the occupation of Iraq, a tacit assumption among some in the US' intelligence establishment that Shi‘ism posed more of a threat than Sunnism. It will be a problem for us, however, if we not only did support Jundallah but if its leader can document that in an Iranian show trial. The biggest issue is not that it would harm our relations with Iran, which are pretty much so far below Dante's ninth circle of hell at the moment that mild alleviation does little, but it could hurt our relations with Shi‘ites elsewhere, particularly in Iraq, where the political situation on the eve of elections and with renewed sectarian clashes is in flux. Iraq may be the reason for the emphasis on the arrest. See: the US is supporting Sunni terrorists and undermining the national unity of the state. Blame the US for fomenting what, at best, they may have been covertly backing. Whether through our own blunders or Iranian successes, the US is once again drawn to the brink with its Iraqi allies/clients. That would serve Iranian goals far more than any positive local reception gained from friendly relations and a cat got down from a tree by US soldiers. We need to be careful here. The whole story on which this post is predicated may, and perhaps likely will, prove either peripheral, exaggerated, false or not worth the effort. But there are subtle prejudices coming out of their divisions, but they don't take you closer to Pike's Peak. Hamas Figure Arrested in Damascus for Dubai Link? I don't know if this report is true but apparently more than one source is reporting that a senior aide to Mahmud Mabhouh has been arrested in Damascus for possibly revealing the travel plans of Mabhouh prior to the Dubai hit operation. If this proves to be true it would bear out reports from the Dubai authorities that the leak came from within Hamas, which Hamas has been denying. Hamas has claimed that Fatah collaborated with Mossad; if the arrested man is guilty, then the question is, had Israel infiltrated Hamas, or had Fatah? Middle Eastern aficionados of conspiracy theories (who are plentiful) will no doubt have fun with this one, if true. Father Abraham, Avraham Avinu, Ibrahim Khalil Allah, the kids are fighting over the will again. There is probably no place in the highly explosive Israeli-Palestinian theater, other than the Haram al-Sharif/Har ha-Bayit (Noble Sanctuary/Temple Mount) in Jerusalem itself, more potentially explosive than the massive Herodian tomb-structure (left) rising over Hebron known to Israelis as the Tombs of the Patriarchs (or, Biblically, as the Cave of Machphelah, Me'arat Machpelah) and to Muslims as the Haram al-Khalil or al-Haram al-Ibrahimi. (Khalil, meaning "friend" as in the Friend of God, is a Muslim sobriquet for Abraham, and also the name for the city of Hebron.) It is surely one of the few places on earth (the only one I can think of just now, but I may be forgetting something) where a synagogue and a mosque exist and function within the same very ancient site. In 1994 it was the site where Jewish terrorist Baruch Goldstein took an automatic weapon and killed 29 Muslims at prayer in the mosque. It's an enormous, amazing place, and perhaps even more than Jerusalem itself, a symbol of the fratricidal nature of the Israeli-Palestinian conflict, since Abraham is the founder of both peoples by their own testimony. But it, and another holy site in Bethlehem, Rachel's tomb, though both beyond the Green Line, have now been named Israeli Heritage Sites, at this difficult moment in the peace process, and the results are predictable. Since both Judaism and Islam claim Abraham as their founder, in today's context conflict is inevitable. 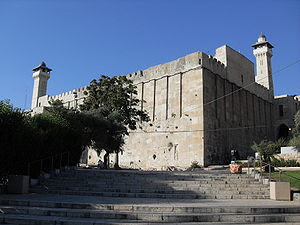 Since ancient tradition insists this is the site of the burial places of Abraham and Sarah, Isaac and Rebecca, and Jacob and Leah, buried in the Cave of Machphelah (and indeed, there are caves beneath the monuments), this is a holy place to all three Abrahamic religions, though relatively few Christian pilgrims visit it. (Some Muslims say Joseph is buried here too, though Jewish tradition venerates his tomb near Nablus.) In other words, patriarchically speaking, pretty much a straight flush. The big six. On the other hand, it's Leah who's buried with Jacob in Hebron, and generally speaking Rachel is considered the matriarch of record for Jacob, who had two wives, since she's the mother of Joseph and Benjamin, and thus of the main line of Jewish tradition (though Leah bore the patriarchs of the other ten tribes). Biblical tradition placed her tomb a couple of places, but one of the most visited and revered was on the northwestern edge of Bethlehem. Bethlehem, like Hebron, is of course in the West Bank, in territory Israel only occupied in 1967. And Bethlehem and its neighboring towns and the big refugee camp nearby make that area one of the more populous in the West Bank. 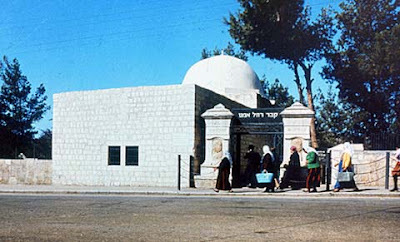 Rachel's Tomb (pictured) was originally on the Palestinian side of the Separation Wall, but lately an adjacent house has been annexed and walled off and the separation wall has been extended to include the tomb. Beyond the fact that the Separation Wall itself raises a great many issues, I think it worth just looking at this GoogleEarth picture on the right (copyright by Google fully acknowledged please don't come after me) and noting that the wall actually goes down either side of a road to enclose the tomb in a sort of enclave (below left center of the picture) that really makes its artificiality obvious. You used to go right by it driving into Bethlehem. So why, nearly 43 years after the 1967 war, did Israel wait until this past Sunday to declare these two explosive holy places Israeli National Heritage Sites? Netanyahu said he did it at the persuasion of the religious party Shas. Not surprisingly, Palestinians are protesting and throwing stones in Hebron and elsewhere; the UN's against it, and there's talk of a new restoration plan for the sites. PA officials are protesting, Jordan is protesting — but this happens whenever there is a change in the status quo of religious sites. The question is why was this done now? Given recent actions by the Netanyahu government it really is getting hard to assume that this is all just poor judgment or ideological purity (why not sooner? ), and to assume that there is actually an intention to provoke. I'm trying to find an explanation in my own mind for why this was done now. It seems to have set off a Palestinian reaction — both officially and in the streets where stones are being thrown again — and almost makes me wonder, does Netanyahu want a third intifada? Netanyahu could have done this years ago if it was purely a commitment to ideology: everyone understands the sanctity of these two sites to both Muslims and Jews, and for that reason efforts to change the status quo have been few since the creation of the synagogue inside the mosque. I fully recognize the veneration both Jews and Muslims have for these sites (especially Hebron), but doing this right now, more than 40 years after the six day war, has a feel of provocation rather than affirmation. Abraham, that wandering Aramaean as the Bible itself calls him, would, I trust, prefer not to be fought over quite in this way. But this particular time I have to say the Israelis seem to be the provocateurs. And I'm not sure why at this time. They control the sites, and long have. Why change the status now? Qifa Nabki does some of the best satirical blogging on Lebanon I've seen, but he's outdone himself with this (fully illustrated) guide to specialized IPhone apps for Lebanon. Some of the jokes may not export well, but others will resonate with anyone with even a slight (or in my case, outdated) familiarity with the country. The two men who have both indicated coyly they might run for President of Egypt under certain circumstances, Mohamed ElBaradei and ‘Amr Moussa, have met to discuss "the internal political issue" in Egypt as well as nuclear issues. (If, in the publicity of the last few days, you have forgotten this, ElBaradei used to know something about that subject.) Moussa is still Secretary-General of the Arab League. "I'm willing to run against anyone in upcoming presidential elections if the public wants me to," former International Atomic Energy Agency director Mohamed ElBaradei said on Sunday during an interview on a popular television talk show. "I'm no savior, but you can help me transform the authoritarian system--by which we've been ruled for 7000 years--into a democratic system," he said. "I would wager that about 99 percent of the people are desirous of this change." "We must change from a people who are told what to do into a people who can present their political, social and economic demands in an appropriate manner," he said. ElBaradei went on to thank President Hosni Mubarak for ordering the opening of the Cairo International Airport's VIP arrival hall for his reception last Friday. A couple of thoughts here: if you're really going for 99% of the vote, you probably lost the Wafd by saying the country's been authoritarian for 7000 years. (What about the years of Zaghlul and Nahhas? We may not think they were democratic, but the Wafd likes to.) I'm not sure the Muslim Brotherhood is likely to board this bus either. I will try to find and watch the interview in Arabic. I'm curious if the remark about Mubarak opening the VIP Arrival Hall to him at the airport was sardonic or not. The VIP Arrival Hall, I believe (not being a VIP), is separate from where his supporters were waiting and might have been a way of keeping interaction down. If you haven't already seen it, The Arabist's piece over the weekend on "What Does ElBaradei Want?" is a useful analysis. He suggests ElBaradei and many of his supporters see his role not as a candidate who is likely to be allowed to run, let alone win, but as a symbol and a voice for the opposition and for rallying calls for change. If that's his goal he has a lot more chance of success, I think, than if he expects to run and win. And that picture with ‘Amr Moussa above is also a reminder that even some highly prominent Egyptians who got where they are through the Mubarak regime are becoming critical of the inevitability of a Mubarak dynasty. And it suggests ElBaradei is willing to tap into the establishment as well as the opposition. It would be interesting to know what the senior officer corps thinks of all this. Impossible to find out, but interesting to know. Iran's latest campaign to enforce usage of the term "Persian Gulf" as opposed to "Arab Gulf" or simply "Gulf" is continuing. Iran is now saying it will ban airlines that don't use the term "Persian Gulf." This latest raising of the perennial issue apparently stems from Iran's firing and expulsion of a Greek flight attendant on (domestic Iranian operator) Kish Airlines, because the aircraft's monitor displayed the term "Arab Gulf." It isn't clear why this flight attendant was singled out, and the story also suggests the whole flight crew might be fired. I addressed this issue just a month ago, and it remains a chip on Iran's shoulder (as if it has nothing else to confront its neighbors over). David Mack: "Spy and Counterspy: UAE Using Advanced Technology"
Saturday's Washington Post surveys the use of new technologies to foil secret assassinations, like that of Mahmoud al-Mabhouh in Dubai. Although WaPo does not mention the fact, the UAE has used iris scan technology in its immigration security for three years now. According to a senior official of the Ministry of Interior, about 54,000 people were arrested at Dubai International Airport last year after failing an iris scan. Moreover, Brigadier Obaid Bin Surour, Deputy Director of Dubai Naturalisation and Residency Department said the DNRD staff and officials at the airport were able to seize 1,088 forged passports last year. This raises the possibility that the UAE authorities have more to reveal. Perhaps spies and assassination teams will stop acting as if Dubai is a free fire zone for their activities. If Mossad was involved, as many suspect, it may be another case where desire for an intelligence coup may have undermined the presumably larger Israeli desire for detente with the Arab states. But that assumes that Prime Minister Netanyahu and Foreign Minister Lieberman really care whether Israel becomes an accepted part of the Middle East neighborhood. Then there is a juicy LA Times article by the intrepid reporter Borzou Daragahi. He is on the trail, and he quotes the head of Dubai police as saying they have more evidence to reveal. Borzou does not, however, have the iris scan angle. I know the head of Dubai police, and I know of the high degree of professionalism of his staff and other UAE services. Also, I have stayed at the Boustan Rotana where the hit took place. I think it will be a while longer before Israeli guests are welcome there under their true identities, and they might be more cautious about using the identities of other people. The Arabs of the Peninsula have advanced quite a lot from the days of Wilfred Thesiger! There are somewhat confusing reports of what may have been a molotov cocktail thrown at Cairo's ‘Adly Street synagogue from a hotel across the street. Here's one account. Not surprisingly it's getting attention in Israel; this Ha'aretz report and video makes it sound rather amateurish, as if the attacker dropped his suitcase with the bottle explosives and the fire remained across the street from the synagogue. Jerusalem Post account here. It sounds amateurish at best, and the security services seem to have turned out in force in response. This looks like an isolated incident, though the government recently accused an underground Islamist group of planning to attack the tomb of Rabbi Yaacov Abuhatzira in the Nile Delta, a site of Jewish pilgrimage. Issandr El Amrani has some background on those behind the ElBaredei campaign in Egypt. And here's his Flickr photostream from Cairo airport. More photos on the campaign website. And Zeinobia has a roundup of pictures, tweets and video. Also Al-Youm al-Sabi‘ has photos at the link and here. I may add other links if more turn up, but otherwise I'm off for the weekend. ElBaradei has returned. He's apparently been given "a hero's welcome" by his supporters. Though "several hundred" cheering supporters greeted him at Cairo airport, there are also reports of a few arrests and of some people being prevented from entering the airport. If video turns up on YouTube I'll post it. Meanwhile try #ElBaradei on Twitter. Fawaz Gerges in The Guardian: "The Muslim Brotherhood: New Leadership: Old Politics." Joseph Mayton responding to Gerges: "Muslim Brotherhood is Young at Heart." Issandr al-Amrani at The Arabist agrees more with Gerges than Mayton, though not completely. Khalil Anani, who usually knows what he's talking about, on the new leadership; (and in Arabic). Morocco Has a Prohibition Law? Okay, this AFP report surprised me. It appears that Morocco has a law dating from a Royal Decree in 1967 forbidding the sale of alcohol to Moroccan Muslims. Now I haven't been in Morocco in years, but I do recall spending time 20 or more years ago (but long since 1967) in bars where the entire clientele, except me, was native Arabic-speaking. So either Morocco's Jewish population (which indeed is one of the larger still remaining in the Arab world) is a lot bigger than I realized, or there's a big Arabic-speaking Christian minority that has been missed by the ethnographers, or (as the article notes), the decree is honored entirely in the breach. Morocco has a domestic wine industry and also a flourishing beer industry, (despite an unfortunate tendency, like other Maghreb states, to define proper-tasting beer the way French person might). The AFP report quotes Islamists who want to enforce the Royal Decree and secularists who want to repeal it. I wonder what the King thinks? I seem to recall some European press coverage when he was Heir Apparent . . . nah, I won't go there. Ayalon was Ambassador to the United States from 2002 to 2006, yet he has just snubbed a US Congressional delegation, creating puzzlement since they were there at the invitation of a Jewish organization that the Netanyahu government is not fond of, J Street, which few other than the Israeli Foreign Ministry confuse with Hamas. This has led to an apology by a senior official, and has led to memories of the earlier snub of the Turkish Ambassador which also produced an apology. Or two. On the other hand, Ayalon, while snubbing friendly Turks and Americans, was hale-fellow-well-met with a senior Saudi Prince, though that also had the advantage of embarrassing a longtime back-channel interlocutor with a public YouTube video. And Ayalon's the professional diplomat on Lieberman's senior staff. Sometimes Egypt's tradition of an independent judiciary still comes through despite many flaws: blogger Wa'el ‘Abbas, who was facing up to six months in jail for rather vague charges, has now been found not guilty. Good for him and good for Egyptian justice. Amin al-Hafez (Wikipedia bio here; photo is also from Wikipedia) was one of those revolving-door Syrian Presidents in the days when coups were frequent, at least to someone just beginning to follow Middle East politics. I was just starting college when he was overthrown. He spent much of the past 44 years in Baghdad where Saddam long kept him (and Michel Aflaq) as irritants to the rival Syrian wing of the Ba‘ath Party. He was allowed to return to Syria as an octogenarian after the fall of Saddam. He died in his native Aleppo. As both the Guardian piece and the Wikipedia bio note, he was the leader who cultivated one of the more famous high-level Israeli spies in the Arab world [at least of those ever caught]: Israeli agent Elie Cohen, who was later executed. 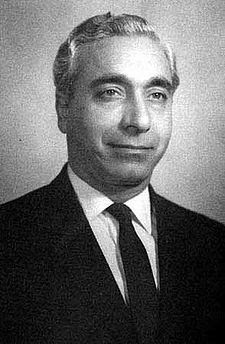 As the obits also note, Amin al-Hafez was in effect the last real President of Syria from the Sunni Muslim community. Though the President who succeeded him, Nureddin al-Atassi, was a Sunni he was but a figurehead, with the real power lying with ‘Alawite Chief of Staff Salah Jadid, while a rising Air Force chief named Hafiz al-Asad, also an ‘Alawite, was getting ideas. Michele Dunne (no relation save a common interest in Egypt) over at the Carnegie Endowment's Arab Reform Bulletin E-mails that they've shifted their format from five articles once a month to one or two a week; when you subscribe by E-mail you can set your delivery preferences to daily, weekly, or monthly. (Or you can choose country-specific, regional, topical, or full RSS feeds.) 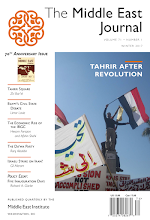 The new issue has two articles, Husam Tammam on "Egypt's New Brotherhood Leadership: Implications and Limits of Change," (also available in Arabic here), and Brian Katulis, "Iraq's Elections Highlight Gap in US Policy," (Arabic version available here). Arab Reform Bulletin is consistently good if you have any interest in following reform and democratization/election issues in the Arab world, and the new format means timelier delivery of their articles. Tomorrow's the big day: the second coming of Mohamed ElBaradei to Egypt. Although some in the opposition would rather he part the Red Sea and walk across, he's flying in to Cairo airport. I guess my previous blog posts on the Mohamed ElBaradei phenomenon have made clear that while I have no doubts the man has more qualifications to run Egypt than Gamal Mubarak does (a lot of senior diplomats and scholars could), I fail to see how, structurally and under the Constitution that only Husni Mubarak and the ruling National Democratic Party can amend, he can even stand as a candidate, let alone win. Perhaps there is going to be a huge spontaneous excitement once he gets off the plane, but remember, the man hasn't lived in Egypt in ages; he probably knows his way around Vienna better than parts of Cairo. And the regime still gets to shuffle and deal the cards. Decades from now, 19 February, 2010 may just be looked back upon as B-Day. Mothers will tell their children of the blessed day when Mohamed ElBaradei returned, like a conquering hero, to personally reshape Egypt into a functioning democracy. All possibilities seem to be in play as ElBaradei returns to Egypt this Friday amid an atmosphere bordering in some circles on the hysterical. Rumors have percolated for days about a mass welcoming committee being planned for the former International Atomic Energy Association chief when he arrives at Cairo International Airport Friday afternoon. “We’re all going. Everybody is going,” said George Ishak, one of the founders of the Kefaya pro-democracy movement, who has been one of ElBaradei’s most high-profile advocates ever since the longtime expatriate first floated the idea last year of running for president in the 2011 elections. “I don’t want to make any predictions on numbers, but it’s going to be big,” Ishak added. As the anticipation grows, the most pressing questions have become: How many people will attempt to greet ElBaradei at the airport? And what will Egyptian security forces do about it? After all, a gathering of people happy to see ElBaradei back in Egypt could easily be construed as an anti-government protest rally. Well, at least it will be something a bit different to watch. I hope I'm being too cynical here, but I rather doubt that I am. Did Fatah or PA have a Role in Dubai? I don't like to spread what may be totally scurrilous rumors, but on the margins of the videorecorded hit against Hamas figure Mahmud al-Mabhouh in Dubai, a classic targeted assassination that looks to almost everyone (including the UK, Ireland, Dubai, and as far as I can tell most of the Israeli media) like a Mossad operation, there was the arrest of two Palestinians in Dubai for some sort of connection with the apparent hit squad. Not too surprisingly, Hamas is claiming the Palestinian Authority/Fatah cooperated with the Israelis in the hit. There are, of course, a lot of Palestinians who have no connection to either Hamas or Fatah, but the traditional conspiracy-theory-prone mindset of the many in the region (and some of us who just study it, for that matter) means that seems almost credible. But it doesn't help move things forward, does it? UPDATED: Tomorrow morning's Ha'aretz is reporting the UK and Ireland are asking Israel about the identity theft involved in the false passports; while a Ha'aretz editorial questions whether the whole affair raises questions about the safety of Israeli immigrants' identities, since some genuine immigrants' names appeared on the passports. Just yesterday Avigdor Lieberman was coyly saying there was "no proof" that Israel was behind the hit. Half the Middle East bloggers and websites and many others all over the Internet have already posted this, but just in case some of my readers haven't seen it, the Dubai police compilation of closed-circuit camera videos of the hit team that killed Hamas figure Mahmud al-Mabhouh in Dubai is like watching something out of John LeCarre. So I'll post it too. It's in three parts. Some are comparing it to the film Munich, but it also serves to remind us of how ubiquitous surveillance cameras have become. All three videos take up close to a half hour. 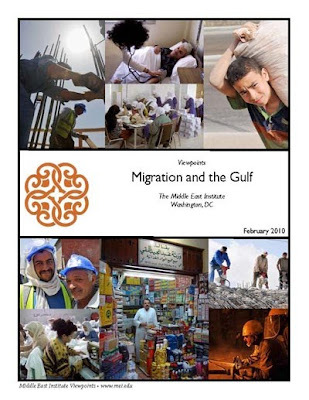 There's a new publication in the Middle East Institute's Viewpoints series on Migration and the Gulf. It's the first of a series of three reports on migration. It contains 19 studies contributed by 21 specialists. The first link above is to the page about the report. The full text (PDF) can be found here. Just a day after President Obama nominated Robert Ford as the first resident US Ambassador to Damascus since the Hariri assassination, Under Secretary of State for Political Affairs Bill Burns has met with Bashar al-Asad. 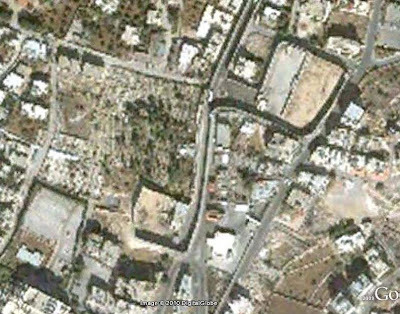 At a time when Syria, Israel, and Lebanon (primarily Hizbullah) have been talking about the possibility of war (See Qifa Nabki on the subject here), the US is clearly signalling a normalization with Syria, even as businessmen are finding new prospects opening up in Syria (see Syria Comment here). Given the fact that the Syrians have been publicly saying for some time that they would be willing to resume negotiations with Israel, and that the demonization of Damascus by the previous US Administration seems to have actually strengthened Syria's regional position rather than weakened it, the new openings would seem to be welcome, and are in keeping with Saudi efforts to seek raise of re-integrating Syria into the Arab world (it being a country that used to boast of being "the beating heart of Arabism") and weaning it aweay from its Iranian alliance. While there have been criticisms that sending an Ambassador back to Damascus is "rewarding" Syria, even Sa‘d Hariri has made the Damascus journey, and the lack of a resident ambassador for the past five years has meant that the US has had little influence in a key player. The Burns trip and the Ford appointment send useful signals, I think, and help dampen the belligerent comments from all sides lately. Lebanese Druze leader Walid Jumblatt has met with Maronite figure General Michel ‘Aoun — in the Lebanese Embassy in Qatar. This comes amid speculation that Jumblatt is also planning to visit Damascus as part of his increasing distancing of himself from the March 14 Movement. It is still the case that Lebanese factions whose power bases are in the same mountains often only talk to each other outside the country. Five years after the Cedar Revolution, one might wish for more, but wishing doesn't deliver much in Lebanon, I fear. A piece in Al-Masry al-Youm (English) on the last days of the Egyptian pork industry, as we approach the first anniversary of the great pig cull of 2009. In a few weeks, the country's biggest pork processor will run out of its stock of frozen meat, and with the herds virtually eliminated, the industry is dying. As the story notes, though the pig farmers themselves received financial compensation for the culled pigs, the others who made their living off pigs, from the zabbalin trash collectors to the meat packers and processors, were not so lucky. And of course, as the names of the various pork processors quoted in the story make clear, this was a Christian industry and the Coptic population has been hit hardest by it, since the Muslim majority do not eat pork. And Egypt had many cases of Swine Flu anyway, none of it apparently vectored through swine. Surprise: British and Irish Passports "Faked"
I'm shocked, shocked. Great Britain and Ireland say that the British and Irish passports carried by the killers of Hamas figure Mahmud al-Mabhouh in Dubai were fakes. And I'd been so sure the Republic of Ireland was responsible for most targeted killings of Hamas leaders. Let's see, who else could it be? Oh, and Yossi Melman at Ha'aretz writes about what everyone considers the usual suspects. Yesterday Lebanon marked the fifth anniversary of the assassination of Rafiq Hariri. The optimism generated by the original "Cedar Revolution" movement seems a remote memory now. Syrian troops may have left Lebanon, but Syrian influence still runs deep, and Sa‘d Hariri has made his trip to Damascus now that he is Prime Minister. I could rehash the events of the past five years, or even just of the past year, but I think most of my readers are familiar with them. It gets to be depressing after awhile. Instead I think I'll refer you to my post of last October, "The Modern History of Lebanon in One Headline." Today is the President's Day Holiday in the US and posting may be a tad light. 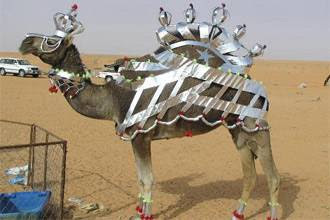 So to start the week, a faithful reader reacts to my post on the Camel Beauty Contest by this link (in Arabic) to this Marebpress post (Arabic) about an Emirati buying a camel for 10 million dirhams (about $2.77 million). I'm not even sure the accompanying photo is the camel in question, but, well, it's not something you see everyday, so I thought I'd post it. A little late in the day for this but before the date changes (though this has nothing to do with the Middle East as such) a Happy Valentine's Day and to those Asian readers who observe the Lunar New Year (speaking as the father of a Spice Girl from Hunan, who's Year of the Dragon) let me wish you a Happy Year of the Tiger. Another English-language Saudi account here, and isn't it interesting how when it's a government-imposed policy, suddenly those who disagree with the Mufti ("Grand Mufti" is actually, I think, a term the British created for Amin al-Husseini; I think the proper title is just Mufti of Saudi Arabia) get good government press? Afterthought: Could this explain traffic in most major Middle Eastern cities? Sorry, we can't ticket anybody, it's haram? The Day After: Was this the IRGC's "Whiff of Grapeshot" Moment? The day after 22 Bahman, everyone is trying to take stock. The regime, clearly, drew its line in the streets and faced down demonstrators. It disarmed the Internet and Twitter revolution by, in effect, pulling the plug. I'm sure this is not the end of the Green movement, but it is a defeat. And it is a victory for the use of coercive force, however much we may regret that. The real victors are not just Khamene'i and Ahmadinejad, but the tiger both men are riding: the Islamic Revolution Guards Corps (IRGC) and the Basij. I am reminded of a parallel — like all analogies, not a very exact one — from a very different Revolution. In October 1795 in Paris, the newly-formed Directory faced a rebellion by Royalist elements. At the Tuileries Palace, a young officer named Napoleon Bonaparte fired on the rebels and saved the Directory, clearing the streets, as Thomas Carlyle famously put it, with "a whiff of grapeshot." Four years later in November 1799 (on the 18th Brumaire in the Revolutionary calendar), the Directory found itself replaced by a Consulate, which was soon dominated by a First Consul, the same Napoleon Bonaparte. Military rescuers of a regime can sometimes find themselves taking over that regime. Iran is not Revolutionary France, and if there are any potential Napoleons in the IRGC ranks they haven't demonstrated their skills yet. But the whiff of grapeshot led to greater things. Was yesterday the IRGC's equivalent? The willingness to use force and to virtually seal off electronic communications with the outside world shows the regime means business. It isn't easy to be the pessimist on Iran's Green Movement. Everyone wants to support the brave protestors and most everyone hopes to see them prevail over an increasingly thuggish regime. I do. But over the last few weeks, Washington DC seemed to have talked itself into something more -- a belief that Iranian regime change was actually nigh, and that such regime change from below was actually more likely and easier than a negotiated deal on the nuclear program. I've been skeptical in public and private...I've been watching Arab regimes survive in the face of popular dissatisfaction for decades, and have seen all too clearly that while Middle Eastern regimes aren't good at much, they're pretty darned good at staying in power. Still, over the last few weeks I've read countless articles, and been told conspiratorially by many Iran-watchers, that February 11 would be the breakthrough for the Green Movement. And now it's pretty clear that it wasn't. After Thursday, the momentum is now with the regime. Either the Revolutionary Guards are getting better at countering the dissidents or movement members are tired of getting beaten up with no measurable political impact. As I said yesterday, the regime blocked the 'flashmobs' by interfering with electronic communication (google mail, Facebook, Twitter). They also thought strategically about how to control the public space of major cities, resorting to plainclothesmen rather than just uniformed police squads. It is also possible that President Mahmoud Ahmadinejad's brinkmanship with the West over Iran's civilian nuclear enrichment program is causing the Iranian public to rally to the regime in the face of American, Israeli and European threats. And a roundup of the day from NIAC here. Few outside the regime are cheering yesterday's apparent setback for the protest movement, but denying it occurred is hardly the best approach. It's the first day back in the office since the snowstorm and, since the schools are still closed, I have my daughter with me. Blog posting will be light till later in the day. From what I can tell at this distance it would appear that the Iranian government's heavy hand was evident and the demonstrations were generally contained. Karrubi's car was reportedly attacked. Huge pro-government demonstrations were visible. Apparently Iran has now shut down gmail altogether and the Internet has been spotty at best. If the closure of gmail is permanent it will affect the Journal, since many Iranian scholars use gmail or yahoo accounts to submit articles, rather than their university e-mails. So far the violence doesn't seem as severe as on ‘Ashura, though whether that's because government intimidation worked or because the news is not getting out isn't clear. I don't usually get terribly exercised about stupid bureaucracy, since all bureaucracy tends toward stupid behavior, and I know we need the TSA to keep us from exploding underwear, but when you read a story like this one, where the main suspicious elements (assuming the CNN story is fair and accurate) seem to have been homemade Arabic flashcards and an ID card from a student stint in Jordan. (Jordan, not Yemen or Waziristan), you do wonder if the TSA has its priorities in the right place, or somewhere else entirely. Of the approximately 200 flash cards, about 10 had words such as "bomb," "explosion," and "terrorist," George said. Let's see. 10 out of 200. Kid says he is learning to read the news. Hmm. Do those words ever appear in the Middle East news? Oh, right. Come on. If we have enemies (as well as friends) who speak Arabic, we need to encourage learning Arabic. During the Cold War did we round up students of Russian? Not to my knowledge. Come on, TSA. This is stupid. You let a guy through who was on watch lists and whose father reported him to the Embassy, but you grab a kid for Arabic flash cards? I love these guys. Anybody else would just shrug his shoulders if he failed to kidnap a girl. But not the Zoaiter boys. They don’t repress their rage; they express it in a healthy cathartic exercise involving shoulder-launched anti-tank weapons. I’m waiting for some enterprising graduate student to write a dissertation on the place of RPGs in the tribal customs of the Bekaa valley. Getting married? Graduating from high school? Celebrating a golden anniversary? An RPG makes everything just a little bit more meaningful. From a poster known as Alex at Syria Comment, a lengthy, closely argued post on "The Case or Syria." Is it pro-Syrian? Yes. Will everyone agree? Of course not. But it's detailed and worthy of your attention. Here's a BBC piece on a camel beauty contest (including video) in the "remote Western region" of the UAE. Actually, camels are serious business in the UAE, though arguably falcons are even more so. I do submit, however, for Arabic-readers, the home page of the Dhafra Festival, and for the English readers, this semi-official UAE report. And "some of which had been driven from as far as Qatar, Saudi Arabia and Bahrain" gives the impression that these camel herds were driven across the desert. That may be so (though it must have caused traffic jams on the Bahrain causeway), but I wonder if some were "driven" in trucks with animal trailers. And Qatar and Saudi Arabia aren't that far, and the roads are good. The Gulf is one of the most culturally conservative regions in the Arab world, and camels, like falcons, are taken very seriously, but the subtle differences between the BBC report and the UAE ones are worth noting. Oh, and before someone screams hypocrisy, yes, I know the Middle East Journal cover currently shown at the upper right shows camels against a sunset (or perhaps sunrise). But it's illustrating an article on Syrian bedouin tribes, and it's a fine photo. There's nothing stereotypical about the article, by an Oxford anthropologist. Added: Don't forget Twitter, the key Iranian communications medium last summer. #22 Bahman is probably the most important, but #bahman, #iran, #iranelection, .and others are worth following. I'm sure there's going to be a lot of Facebook traffic too. We're still snowed in and the Federal Government is closed again tomorrow. I'll keep blogging, however. Since tomorrow is the big celebration of the Revolution and the day of expected confrontations in Tehran, and since the government is threatening some very serious crackdowns, I thought I'd point you to some on-the-eve pieces at Tehran Bureau, at The Daily Beast, and at Enduring America. These are sites that, from varying perspectives, have followed the opposition movement closely. I'll be posting my own reactions tomorrow as well, but they will be devoting more time to it than most. The New Samaritan High Priest; The "Cohen Gene"
I noted on Friday the death of the Samaritan High Priest, since I see the "Putting Middle Eastern Events in Cultural and Historical Context" subtitle up there as something of a mission statement, and also because I have a personal fascination with the smaller remnant historical communities that still dot the region. The new High Priest is the same age as the one who died (both born 1927). The reason, explained in the link, is that until 1624 the Samaritan High Priesthood descended from father to son in the line of Aaron's son Pinchas (the line of High Priests in Orthodox Judaism as well, the kohanim), but with the shrinking of the Samaritan population, the last Pinchas descendant died out in 1624 and the line shifted to the descendants of Aaron's other son, Itamar (the Levites, in traditional Jewish terms, though the kohanim also originate from the Tribe of Levi). On the Levite line, unlike the earlier one, the oldest surviving member of the priestly class succeeds. Hence, he's the same age as his predecessor. The Samaritans have always claimed that they preserve the genuine tradition of the Northern Kingdom of Israel; while mainstream Judaism claimed they represented a bastardized population planted in the Northern Kingdom by the Assyrians and who gained in strength during the Babylonian exile of the Judaeans. It is, of course, fairly natural to assume that a lot of this is legendary: Aaron was Moses' brother, after all. But lately some strange things have been happening in DNA studies. Now, let me emphasize that I don't like discussions of race or even ethnicity: the 20th century was plagued by the "scientific racism" that classed people according to skull shape, skin tone, or imagined ancestry, and the horrible results were eugenics in the West and the Holocaust in Germany and its conquests. Race is a social construct. My daughter was born in Hunan, but the discussion I had with her last night on Alice in Wonderland was utterly free of any genetic predispositions. I don't believe in race. But DNA can tell us something about historical traditions. I don't care if you're a Cohen or a Jones or Smith (my mother was a Jones), but the emerging genetic maps from the study of DNA are telling us some interesting things. First, they're telling us we're all close kin. Old notions that the alleged "races" evolved separately have long since faded away. A few Western Europeans have some traces of native American DNA; go figure. DNA isn't race; race is a construct. But DNA does have some curious tales to tell. Speaking of Samaritans and others tracing descent from Aaron, it gets really weird, at least for those of us who aren't fundamentalist/literalist in our approach to religion. There is a DNA haplogroup (a category of genetic descent widely shared) that has been dubbed popularly the "Cohen Gene" or more officially the "Cohen Modal Haplotype." The technical material is mostly dealt with at the Wikipedia entry "Y-Chromosome Aaron." Now the so-called Cohen gene is not found exclusively among Jewish people named Cohen (or translated names like Kaplan, Kagan, etc. ), but also among other Jewish and also broader Arab and other Middle Eastern populations, and even beyond. But it is highly intensively found among persons whose names are traditionally considered priestly in Jewish communities. And it is found in Ashkenazi, Sephardi, and Mizrahi communities in slightly differing proportions, but still heaviest among the Cohen families. A recent genetic study in 1996 suggested that more than 50% of the Lemba Y chromosomes are Semitic in origin; a subsequent study in 2000 reported more specifically that a substantial number of Lemba men carry a particular polymorphism on the Y chromosome known as the Cohen modal haplotype (CMH), which is indicative of Y-DNA Haplogroup J found amongst some Jews, and in other populations across the Middle East. One particular sub-clan within the Lemba, the Buba clan, is considered by the Lemba to be their priestly clan, while among Jews, the Kohanim are the priestly clan. The Buba clan carried most of the CMH found in the Lemba. Among Jews the marker is also most prevalent among Jewish Kohanim, or priests. As recounted in Lemba oral tradition, the Buba clan "had a leadership role in bringing the Lemba out of Israel" and into Southern Africa. Now, as for the Samaritans, which is how I got dragged down this back alley in the first place, they seem to have elements of the Cohen gene but not the same y chromosome descent as the mainline of Cohens. But note, above, that their High Priesthood shifted from the Pinchas line to the Itamar line in the 1620s, according to their own acknowledgment. And of course the punchline: they say the "Cohen Modal Haplogroup" suggests a common male ancestor in the Y-chromosome line about 3000 years before the present. That's several hundred years after most Biblical historians would date Aaron, but it's still pretty impressive. Kohanim from all known Jewish populations do have a common male ancestor, and he may not be all that later than Aaron. Hence the geneticists' coinage of "Y-chromosome Aaron" for the unknown male ancestor. MB Deputy ‘Ezzat a Takfiri? An Emerging Theme? Is the Latest Nuclear Rhetoric about February 11?